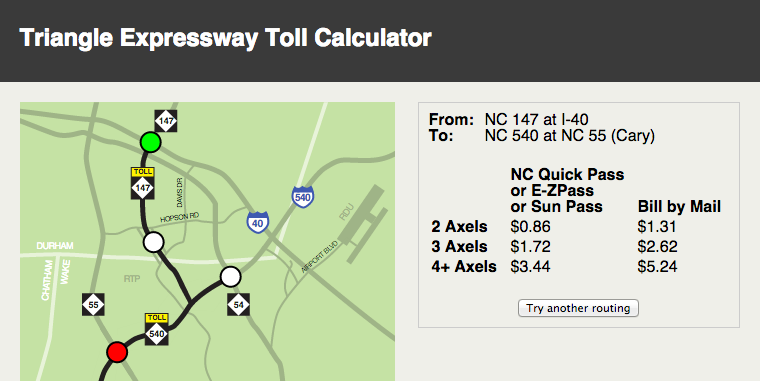 I have long been annoyed by the Triangle Expressway's PDF by which you have to carefully piece together the toll charges, so I made a map-based calculator. NCSU's Centennial campus is growing quickly. Now that all search engines have their own satellite image powered maps you can watch the growth unfold. On the same day I got screenshots of the campus at various stages of construction over the past three years from Microsoft Terraserver, Yahoo! Maps, Google Maps, Microsoft Live, and Ask Maps and stitched them together with Slideroll. On a side note, Slideroll does not seem that impressive in its current incarnation. It restricted my 1592x1265 screenshots to a mere 360x240 animation. Even with a pro account you are limited to 600x480, a bit weak for a Web2.0 site. Maybe they just don't get it. So what is it? Community Canvas allows you to draw by colouring in squares. As you draw your changes are saved for all to see. Also, as others make changes the changes will propagate to your canvas, even as you are still drawing! So go ahead, try it out with a friend. Good thing this is not a blog or that would be a seriously sorry state of affairs. One post every two months, course for par I guess. Anyway, some actual news this time: two Java applications were released. Both of these were written to fulfill a need I had and have been released in case anyone has the same needs. Photo Notes is an image caption program. Basically all it does is allow you to save captions/notes for photos you take. Its main strength is that it doesn't lock you into a proprietary caption format or program. It's all stored in plain text so your captions will remain accessible for many years to come. The title for this one is pretty self-explanatory. It looks a lot like a real alarm clock, is fairly simple to use, can be run as both an application or an applet, and supports 12 hour and 24 hour formats. Some olds (not exactly new anymore): News & Observer got another letter to the editor on January 19th after they ran a story on the new Airbus A380 with this diagram. Or so it seems from the comparison visual aid on the front page of today's business section. It is quite clear that the Airbus A380 visual is just a modified version of the Boeing 747 one, yet in reality the two look nothing alike. The A380 does not share the 747's pronounced nose, opting instead for a first floor cockpit and a large forehead. For many in the Triangle this may be their first introduction to the A380 and you've just given them the impression that it is a close copy of the 747. Why would you mislead them in this way? A little research (a 30-second visit to Airbus' corporate web site at the very least) would have revealed your error. T'is the season again. 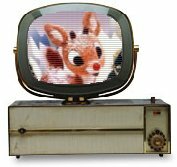 No doubt Rudolph will be on TV soon, if he hasn't already been. To all future parents, when you have kids relocate north of Pennsylvania. A childhood without snow must be dull. Think of the children. Another New Year's in Vienna is coming though, the b-day and Christmas too, of course. Fungible = something that is fungible, no kidding. Oh, and I skinned the site for my new domain I purchased a few weeks ago, redcarton.com. I read a News & Observer article yesterday during breakfast about how a police officer (who was subsequently fired) groped two women after pulling them over. Something in the article struck a nerve though: they actually published the street names where the women lived! What? Is it North Carolina law that you must publish the addresses of victims (such as in today's cover story “Woman accuses ex-cop”) or is it simply because you lack any respect for the privacy of others? I can understand warning neighbors of a suspected criminal in their neighborhood, but victims too? Is that not going too far? After all, they are the victims. Just because this information may be in the public record does not mean you should publish it. Is the city of residence not enough for your readers? I appreciate your note and your concern for privacy rights of crime victims. Our policy is to publish the street address of most crime victims in order to clearly identify them apart from someone with a similar name. I'd like to point out that we did not print the victims' house numbers in the story you mentioned. Again, thank you for your note. Ms. Bischof, hmm, we'll let that one slide. So yeah, I had noticed that they omitted the house number from the address but at that point you've pretty much given it away to everyone in the neighbourhood. As for the case of mistaken identity I agree than it can be annoying but they also published the ages of the victims so how likely is it that two people in the city with the same name also have the same age? Not very. At least their intentions were fair, if only a bit misguided. A bit late with the news I know, I know, but I won an iPod mini two weeks ago. On Saturday the 18th a package containing the iPod was magically delivered from the Computer Science Department at NC State. Seems I was one of four alumni to win an iPod's in a random drawing of June's survey participants. Cool stuff. I never understood everyone's infatuation with this MP3 player but now that I have one I'm a believer too. I must admit it's quite sleek in it's neon green brushed aluminum case. And the touchpad scroll wheel is so hot! I guess it's time to go spend some money on iTunes (don't you just love gifts that propel you to spend more money?). First the Sony digital camera, now this; it must be my lucky year! The French speaking countries are always prominent in the logs of course, as are the United States and Germany, but more surprisingly so is Mexico to a lesser degree. Also interesting is the number of African and South American surfers. 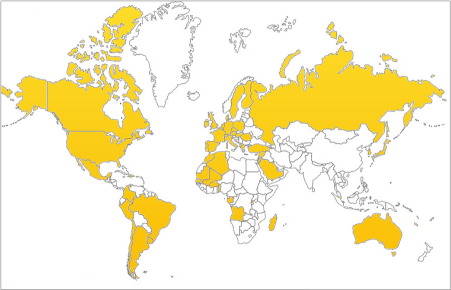 I guess it makes sense if you consider that more and more schools in developing countries are getting wired. Some are classics, others a bit of a strech. Oh the stereotypes! I wrote this back in January but never put it online. There are still a few bugs in it but they seem mostly related to AOL's TOC servers and the Jaimlib library on which JaimBuddy is written. I wrote JaimBuddy mainly to familiarize myself with a number of Java structures and components that I had limited exposure to. Among those are Properties, JSplitPane, JEditorPane, JOptionPane, Action, as well as translucency, key remapping and custom list cell renderers. JaimBuddy is pretty limited though and it definitely is not meant to replace AIM. To say that LEGOs were my favourite toy would be an understatement. I spent hours playing with them, but could you really blame me? What toy or game is possibly better than LEGOs? Not only could you create your own stories with them, but you could also create the environment in which they took place. If you can imagine it you can create it; much better than linear video games and G.I. Joe dolls (oops, action figures). Can it get any better? I built a huge space city complete with a two-story police station and an elevated high-speed commuter and cargo train. It was in the basement play room for years then one morning in 1998 I decided that I was old enough and an hour later or so it was all packed up in boxes. I didn't take any pictures; man, that was stupid. I since came to regret not taking pictures and vowed to rebuild it once I graduated. The time has come so I rebuilt it last week and took plenty of pictures. The space city is a shell of it's former self (some vehicles and small structures didn't survive the move, e.g. an ambulance, a transit station and a truck that could drive on the road and the rails) but all in all it's pretty close to what it was. I also took some pictures of complete sets that I still have. I forgot how much fun playing with LEGOs really was. Best. Toy. Ever. I graduated yesterday with my Master of Computer Science degree from North Carolina State University. Thus ends my stint in academia. Running a light in Raleigh is getting downright risky. Seven more red light cameras are going up, doubling the number around the city. Funny, I always thought that running a red light was by its very nature risky. Automobiles are like dogs. They let us down sometimes, they misbehave at inconvenient moments, and we're sometimes angry at them for being a nuisance. But for the most part they're loyal to us. And we love them more than the neighbor's even if the neighbor's is prettier. Computers are like cats. They're cute when they're brand new and purring along. After six months you realize they're useless and plotting to kill you. You want to kick the stupid thing out the window. For the record, both cats and dogs are annoying, but at least cats are a little less annoying. It's 04-04-04. That's only the fourth time that has happened since December 12th, 1912. Finally, a day where the YY/MM/DD, DD/MM/YY and MM/DD/YY people can agree on. For the record: YY/MM/DD is the right way to do it, DD/MM/YY is acceptable and MM/DD/YY is just dumb. Well, ideally it should be YYYY/MM/DD. I made the switch to Mozilla Thunderbird from Outlook Express last week. I tried Thunderbird out quite some time ago but I wasn't all that satisfied with it. Nonetheless I made the switch because I need two computers to have access to my mail. Although I can do that with OE and Outlook, OE was very tempramental when I did that a few years ago with two XP users on the same machine and Outlook locks the .pst file when in use. Thunderbird has some nice features such as separate folders for POP accounts. However, in only a few days of use I already have a lengthy wish list. If only the top 10 could be handled I think Thunderbird would be ready for gold release, hopefully sooner than later. I didn't mention this last time, but I won a Sony Cybershot DCS-P10 5 megapixel digital camare at work on March 1st. It's a great little camera and I put it to good use during my Aspen ski trip (the online pictures that start with 101 were shot with it; the ones that start with 115 were shot with the Canon S45). It's nice and light and takes stunning pictures. It's a bit lacking on some features compared to the S45 but overall it's a great camera. I came accross this today that I found pretty funny. During snow falls (what they call snow storms here) all the local channels list the school and business closings. To speed things up they let you submit your closings on their Web sites, but aparently as our local News 14 Carolina channel 14 shows they don't actually filter through the submissions. Some of them are hilarious, while others are hard to believe (e.g. "Windows 32 Exception Error" and "All Your Base Are Belong To Us"). News 14 got pwnt! I have been to heaven, and believe you me it is in Colorado. I went on a spring break ski trip to Aspen-Snowmass last week and it was absolutely fabulous! We had clear blue skies, 10-20C weather and amazing snow. Check out some of the photos. We skiied two days in Snowmass, one in Aspen Highlands and the final day on Aspen Mountain. Buttermilk looked a little small, so we stayed away from it. Getting back home was an experience though. The original plan was to fly to Aspen through Minneapolis-St. Paul, stay there 5 nights, and head back to Raleigh through Memphis. Instead, the Memphis flight was delayed (the plane had to return back on its way to Aspen) so we were transfered to a Minneapolis-bound flight. However, the temperature was too warm for the altitude and the plane would not have enough lift to take off so they had to remove fuel from the plane. After that was finally done a passenger wanted to unboard (since she would miss her connection in MSP) and that delayed us even further as they had to remove all her bags (and find them first!). Then of course we didn't have enough fuel to make it to MSP so we had to stop in Grand Junction to refuel (a very strange place, it was all dry with sand-like mountains nearby even though it was a mere 20 minutes from Aspen). Of course we missed our connection to Raleigh so Northwest put us up in a hotel. On the up side, we were able to go to the Mall of America, which was neat. It didn't have an indoor hockey rink or submarine and the water park was much smaller, but the amusement park was of similar size as that in the West Edmonton Mall. Personally I liked it better than the West Edmonton Mall as it was better looking and on four floors instead of two really long floors. And it had a cool Lego store to boot! All in all an amazing vacation! Way cool! These mini 8cm rovers are so cool! It looks like you can drive over all kinds of stuff with them, and even play laser tag. Some of these action shots are great, people have too much time on their hands. Then again, I could easily see myself building one of these. You can even get a video camera for it. $50 for a rover seems alright, I don't know about the $115 camera though. If you have money to blow, get one! And get me one too. I neutered my :CuteCat yesterday. 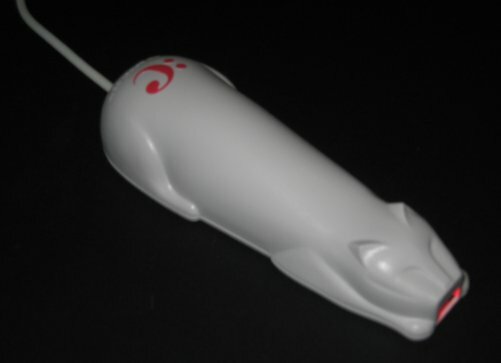 I got the :Cue barcode reader back in 2000 when Radio Shack was giving them away. Digital:Convergence, the cat's manufacturer, has since gone bust (after spyware claims and whatnot), so I found a new keyboard driver that decrypts the barcode input and dumps it as keyboard input. It works pretty good for the most part but it does make mistakes sometimes. Maybe I'll try one of the simple hardware fixes later on.